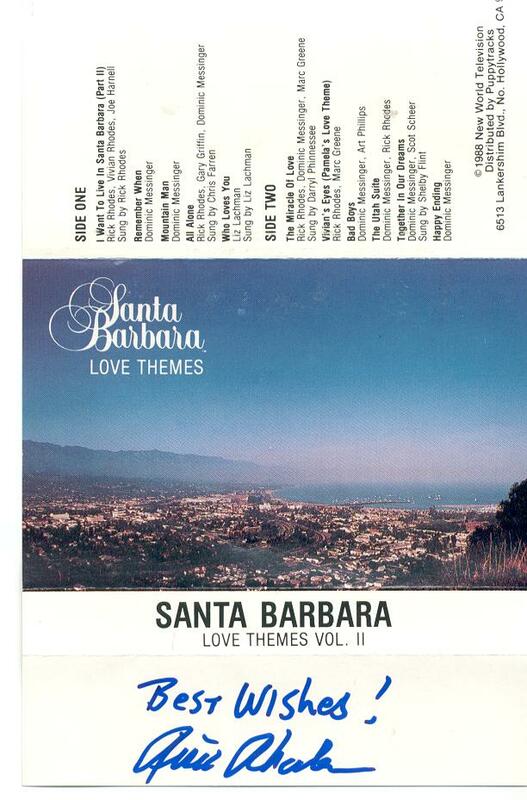 Go to my Santa Barbara DVD Log - updated! For the latest version of my SB calendar (in excel format), go to my DVD Log and look for the link to download the latest version. I've spent many years working on the calendar with the help of other SB fans. It gives fans an accurate listing of the episode numbers and their corresponding airdates. Go to my Santa Barbara Re-Air Campaign website! Help us get SB back on TV! Help Get SB on Soapnet!! Please buy two bracelets: one for you, one for you to send to SOAPnet! The price is 1 for $3 or 2 for $5. This cost helps me reimburse the money I spent having them made. This page is basically my SB info page. Below you can find some links to other SB sites, related sites, info on the audio tapes I have, and info on nice/mean folks in the SB online community. For my SB tape/dvd collection list, go to my tape log page. Arina's SB Videos Page - Watch full episodes of SB online! WoST - World of Soap Themes. Return to Santa Barbara - a new fanfic! Lane Davies' site. Lane's website has clips of SB titled The Mason Chronicles. Harley Jane Kozak's website - Harley has a new mystery novel, Dead Ex. It's a sequel to the wonderful Dating is Murder and Dating Dead Men. Her books are funny, suspenseful, and I highly recommend them! Jed Allan's new book is out! It's called "Please, Spell the Name Right". I really enjoyed it! Check his publisher's page for details. Click on any of the photos to see them larger. Autographs from Rick Rhodes and Lane Davies. Rick and Lane were both super nice when my friend Mark and I met them at performance of A Christmas Carol. Autographs from Harley Jane Kozak at The Mystery Bookstore in LA. Harley appeared to promote her new book, Dating Dead Men. Autograph from Nancy Lee Grahn at the GH fan event! Nancy and her daughter, Kate, both signed my old SB clipping. Autograph from Jed Allan at Brentano's for his booksigning! He signed my SB clipping for me. Louise Sorel was also at Jed's signing and chatted with me and Mark for a while. Louise was kind enough t sign an SB collage for me - unfortunately I had no Augusta photos with me! Jed and Louise were both very sweet! My goal has always been to provide a safe and cooperative online community for all Santa Barbara fans. Shannon, US (shannie172) - Shannon is way cool. Nicolas Bibard, France - Nicolas is awesome. Kimmah, US - practically perfect in every way! It's always nice when describing your collection to tell the other person the video quality of what you have. Check out my tape log page to see some of the tapes/dvd's in my collection. Also, feel free to e-mail me if you have questions about other people in the SB online community. I also suggest becoming a member of the SB discussion list. Here is the track listing for the Puppytracks tapes, which I've converted to CD from my original cassettes. Click the images to see the cassette liners bigger. SB Music (1 CD) This is a random mix of 14 songs that Denis in Croatia sent me. Eden and Cruz Love Themes (3 CDs) Sent to me by Katie, a great collection of E&C songs. Copyright www.lisa071573.com, 2007. Disclaimer: All collection lists are provided for informational purposes only to assist other fans.